So, in the blogosphere, Do It Yourself projects are huge. My issue is, I so often have the ideas, but rarely the time to... well... do it myself. Case in point: Here is a picture I took last May of a sweater I wanted to attempt to recreate. 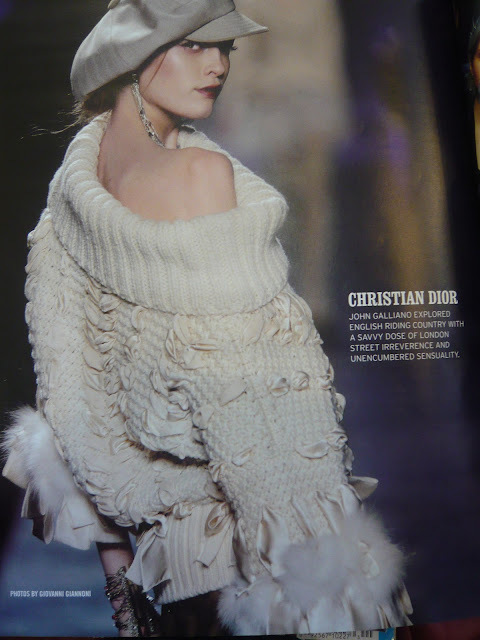 I mean, Christian Dior is brilliant and all, but, I'm thinking an oversized, nubby Goodwill sweater... add in some wide satin ribbon... and voila! (Now, the sleeves are a bit much. I'd tone those down. I also had the idea way back then that *gasp* I may never get to it myself, so I should send it to Love, Maegan and see if she'd be up for it. Now she's gone and posted this. So, I'm thinking maybe she should still see this sweater? which she may have already when she saw it in the fashion mags last Spring but just forgot. Hmmm... maybe I should just post my ideas on here, and then any reader who wanted to take a crack and DIY'ing them could and send me pics of the result? Or just send me the item.